I recently found a great political sticker about capitalism and the economy that looks very much like an I.W.W. stickerette due to its size, medium, and message. 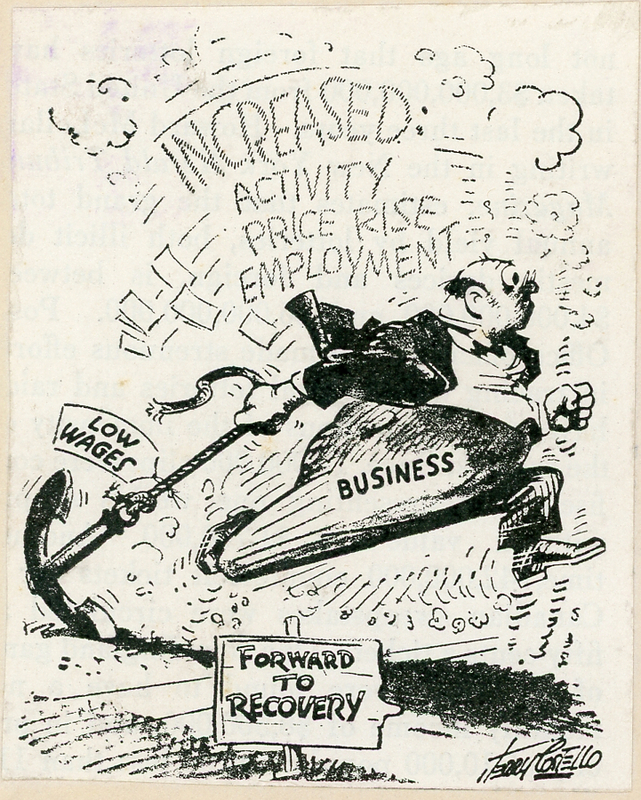 It states “Forward to Recovery – Increased Activity – Price Rise – Employment.” We see “Business” dressed as a fat cat in a fancy suit and pinstripe pants racing forward while being dragged down by the heavy anchor of “Low Wages.” The artist’s name is difficult to decipher; the signature looks like “Terry Costello,” but I can’t find anything similar online or in any of my I.W.W.-related books and articles. The reason I think the sticker comes from the I.W.W., however, is because it’s glued onto an envelope dated September 30, 1933. 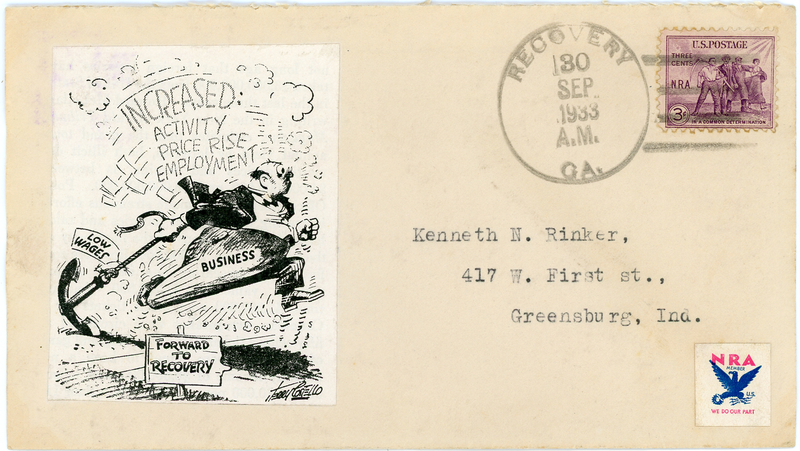 The envelope was addressed to Kenneth N. Rinker, 417 W. First St., Greensburg, Indiana, and it cost three cents at the time to send through the mail. There is no return address on the front or back of the envelope. The envelope was sealed when I acquired it. I opened it only to find a blank sheet of white paper…. Anyway, back to the mysterious envelope. 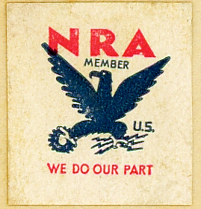 The little NRA sticker on the lower right states “NRA Member – U.S. – We Do Our Part” and shows a blue eagle clutching a gear, symbolizing industry, and lightning, symbolizing power. You can read more about the NRA blue eagle logo here. I have other NRA stickers in the Street Art Graphics digital archive, but they aren’t from the National Rifle Association. The early NRA stickers, which Arline Wolfe catalogued last year, were, as she wrote, “from the National Recovery Administration, a U.S. government agency established by President Franklin D. Roosevelt to stimulate business recovery through fair-practice codes during the Great Depression. The NRA was an essential element in the National Industrial Recovery Act (June 1933), which authorized the President to institute industry-wide codes intended to eliminate unfair trade practices, reduce unemployment, establish minimum wages and maximum hours, and guarantee the right of labour to bargain collectively, according to www.britannica.com.” The Social Welfare History Project Web site also describes the NRA here.